The temporomandibular joint, or TMJ is a small joint located in front of the ear where the skull and lower jaw meet. This joint allows the lower jaw (mandible) to move and function, and is the constantly used joint in the body. The TMJ is a "ball and socket" joint, and the round end, or " ball" portion, is call the condyle; the socket is called the articular fossa. Between the condyle and the fossa is a disc made of cartilage that acts as a cushion to absorb stress and allows the condyle to easily move when the mouth opens and closes. At the back of the joint, the disc attaches to tissue that contains nerves and blood vessels and can be quite sensitive. 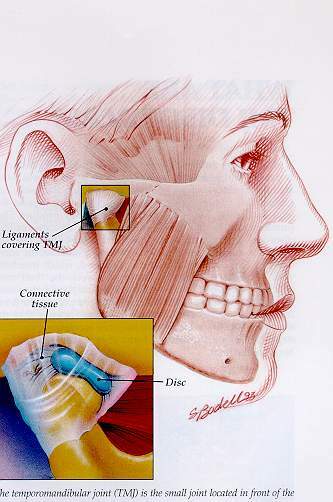 Ligaments hold the disc and condyle in place, and muscles surrounding the TMJ also help stabilize the joints as well as move the lower jaw during chewing, speaking and other functions. The teeth themselves are also important for proper TMJ function, because if they don’t fit together properly, stresses can be generated that can displace the condyle and damage the disc, ligaments and muscles. Trauma can also damage The TMJ and inhibit proper function. When all of the elements of the TMJ are in harmony and working properly, the joint operates smoothly and without problems. However, TMJ disorders can develop if these elements are not functioning, as they should, or if stresses, trauma or other factors generate TMJ problems. 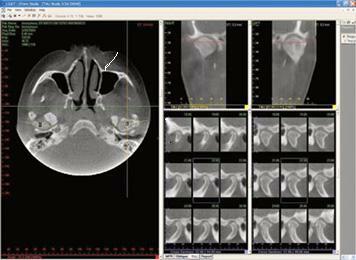 Current sophisticated technology now allows us to take detailed computerized scans of the TMJ while in our office.